Daniel Jones caught up with the artpop guitar-shredder in Berlin to discuss the odd experiences forming the basis of her new album and more, including the Internet, psychedelic experiences and Michael Gira’s Facebook. Sitting in a room in the Michelberger Hotel, the rare Berlin sun illuminating her platinum hair with a halo of light, Annie Clark indeed gives the impression of sainthood—though, perhaps, of the heretical sort. Since 2006, she’s been preaching her unique gospel of manic rock to the world under the name St. Vincent. In that time, Clark has made guitar-shredding brutality cool again, fine-tuned her live show into performance-artpop perfection, and collaborated with the likes of David Byrne, Andrew Bird and, most recently, the godly Swans. Her new, self-titled LP (and fifth album)—available to stream in full—is already being heralded not only as her best release, but also as one of the best releases of 2014. “I wanted to make a party record you could play at a funeral”, Clark stated in the press release, and if you’d ever choose an album to wake the dead, this one could do the trick. 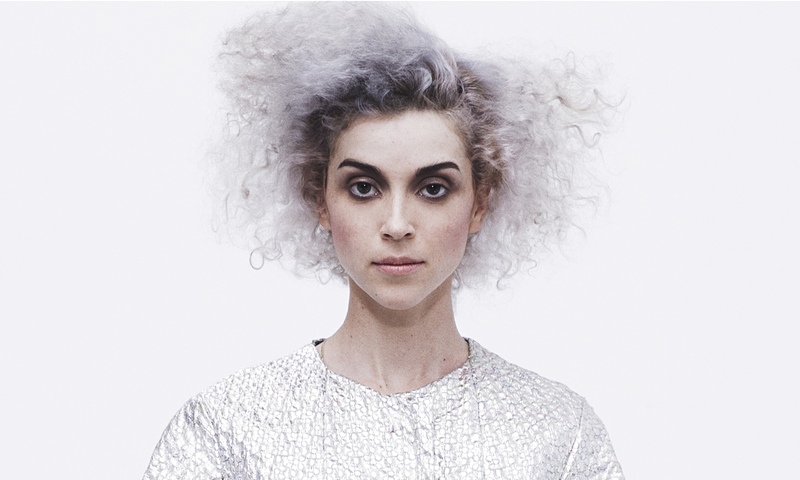 Noticeably informed by her work with Byrne (dig that brass instrumentation) and chaotically ordered in the most listenable way, the multitude of layers on St. Vincent all demand the attention, but always coherently and as a whole—as noisy as it may get, this is pure, exuberant catchiness, with plenty of real-life experience thrown in to the mix. Opener “Rattlesnake”, all jittery electronics set against Clark’s trademark angular guitar work, describes a sky-clad desert experience with the titular reptile, while “Huey Newton” is based on the visions that tend to come from taking Ambien without actually falling asleep. It’s confident, strange and utterly charming—a lot like Clark, actually. I found it interesting that the album opened with a true story about how you’d gone out into the desert, removed all of your clothes, became free—and then suddenly scared, chased away by this rattlesnake. Was there any symbolic reason for that being the first track; this shedding of skin and revelation of self, followed immediately by fear and persecution? There was, actually; I thought that it sounded like a nouveau creation myth. The other side is that, because it literally happened to me, all I had to do was be a reporter and relate the facts of what happened when I was in Texas. It already had the form of this myth, so that was a freebie from the universe. “Huey Newton“, sorry! “Huey Lewis and The News was based on an Ambien hallucination.” They don’t tell you that in rock history class. Ha! That would really change the vibe of that group; the white suits, the shoulder pads…*starts singing* “Don’t need money.” But I think you can’t write about things you don’t know. In some ways I have a really wonderful imagination, and then some ways I don’t—I just write my life, you know? It’s always interesting because sometimes in interviews—and I’ve done a lot of them—there’s this big deal made that I’m writing from the point of view of lots of different characters. That makes me scratch my head a little bit, because I’m thinking, “But that’s me, and that’s me and then that’s me, as well.” It’s sort of like how they say that in dreams, you’re everyone. I don’t know that much about dream theory. But these are all perspectives of different aspects of yourself then? Exactly. Over time, maybe your point of view shifts to some other character in the song, but I pretty much write my life. It’s interesting that you bring up dream theory, because I thought there were many dreamlike aspects to St. Vincent—from the lyrics to the sound engineering, the aural manipulation of instruments to resemble something other than what they were. I know people ascribe symbolism to different things, but not whatever theories are specifically codified. I can interpret in the way that most people can, but I don’t know the ‘rules’—if there are any. I did inadvertently with that Ambien experience, actually—though that was neither sleep nor wakefulness. That was really an intense, hypnotic experience, very psychedelic. There’s also an aspect of techno-spiritualism to it with “Digital Witness”, this condemnation of social media. How closely tied are you to things like Twitter or Facebook? Is that something you avoid? It’s a complicated issue. We perform selfhood in a number of ways: the shirts we’re wearing, the way we comb our hair—ways that we’re consciously communicating something about ourselves to others. That’s one thing in the analog world. Now we have this whole other platform in which to perform rituals of selfhood, and almost create idealized versions of ourselves. In some ways I find that the constant mirror which the Internet creates makes people more self-aware in a good way. The next generation of people who don’t remember a time before the Internet seem to be more self-possessed than I remember being as a teenager. but then there’s another aspect of that which can be a vessel for delusion and narcissism, the negative aspects of humanity. I have a complicated relationship with it. I do like the democratization of technology; I wouldn’t have a career if it wasn’t for the fact that I can make a record largely in my bedroom on a laptop, by myself. I’m curious how it’s going to affect us longterm… when everything we do is kind of mediated by the same interface. What I wonder is what effect it will have on the musicians of the future. It’s interesting, because nowadays people get a round of applause for a meal they eat. We’ve elevated the mundane to such a level that a lot of things are meaningless. It’s hard to sift through what has value and what doesn’t. You just worked with Michael Gira on the new Swans album, and he uses Facebook constantly. Quite a bit! It’s usually good stuff—photos he found on Tumblr from a 1983 Swans gig that he didn’t realize existed, for example. That, I think, is an interesting aspect to it. Whoa! That’s amazing. That shocks me, actually. Right? You wouldn’t expect it, and I love that—that you can have access to the thoughts and even conversation of a favorite musician, can communicate with them on such a level is really fascinating when you think about how huge and distant these musicians were when you and I were growing up. That aspect of it is good, cutting out the middle man and having direct access to fans and artists that you admire. That blows me away that Michael is on Facebook. What sort of impression did you get working with him? Well, I’m a massive Swans fan so I was very nervous—and he has a very strong presence, so that made me even more nervous. He was very kind, though. He called me ‘madam’. I was singing background vocals on three or four songs, and on one particular song he said, “Just sing this one note. It doesn’t matter if you run out of breath, just start again.” The song itself was about seven minutes long, and he wanted me to double the note and then triple it. What happened was I ended up singing the same note for thirty minutes straight without rest, and that made my whole relationship with music change. I’ve never sung one note for thirty minutes; that’s complicated. Vocal chords are muscles, and they kept wanting to give out. It was like doing pull-ups in junior high for the Presidential Fitness Test. Everybody shaking and struggling; nobody could do that! Do you use social media yourself? I totally do! I have a Twitter, an Instagram… but my Instagram is just a one-way street. I don’t have time in the day to follow a lot of people, even people I’m friends with or I adore. I have younger friends who did grow up with the Internet, going on techno-shamanistic relief courses, basically—fasts from the Internet. Yeah, or wits! I think probably the synchronicity is near where we’ll all have some permanent Internet chip soon. Like a constant access chip? That’s kind of scary. We’re not meant to process such a barrage of information, mentally or socially, on such a constant basis. I agree, I think that’s where we all start getting a bit technologically fatigued. We’re constantly asked to not just process information, but to give it value. How does one do that? How does everything not just become… gray? It’s already starting, I think. The complete disassociation of actual self that comes from having to constantly ‘perform’, as you said, for a mass audience you might not have even met. St. Vincent’s self-titled album is out February 25th via Loma Vista and Republic Records. She tours Germany in June.